When things go badly, I often look back and retrace the steps that were taken – by me, by my loved ones, by the electorate of Wisconsin, to see where things went awry. I do this with tragedies small and large, historical and current day, tracing the path back to what life was like before things were awful, if there ever was a before. The noble claim would be that I do it out of obligation to those who have suffered, but the truth is probably closer to this: if I ever travel back in time, I’ll know who to stab. This train of thought is handy; it absolves me of guilt and it makes me feel righteous. I can look at the status quo and pretend that I had no part in it. I can eschew the responsibility that I inherited the day I was born, the day I became something that neither my mother nor my father nor my brother was: a natural-born American. Wading into history lets me run from culpability while under the guise that I am embracing it. It is all very convenient. And so I insisted that we go to Los Alamos to see The National Laboratory, where the U.S. developed the atom bomb during WWII, high in the mountains outside of Santa Fe, New Mexico. I say that “the U.S. did these things,” so you will understand that I alone am not responsible for them. I say that “the U.S. did these things” so you will understand that I understand that in some way, I am responsible. I run from culpability. I embrace it. I knew six weeks later, I’d be in Hiroshima. Later, in some other post, I will tell you about those visits (this is, after a travel blog, or so I claim), about two places tied together by war. But first, I must first retrace the path of history to a time before these weapons existed. Our current news cycle which makes it sound as though nuclear conflict with North Korea is inevitable; I felt like understanding how these weapons came about might help me make sense of that. And while it didn’t exactly do that, my research did help explain how the U.S. can overlook civilian casualties in the name of some sort of “greater good”. A tendency which makes it much easier for us to contemplate the use of nuclear weapons, where there are inevitably civilian casualties, because radiation and fire are not discretionary. Let me begin with indisputable facts: since their invention, nuclear bombs have been used twice in warfare. Both times were during WWII. The targets were Japanese cities full of civilians. The U.S. dropped both of the bombs. The creation of these bombs – part of an Allied project known as the Manhattan Project (largely led by the U.S. with support from the U.K. and Canada, I say out of historical accuracy and also because I think that if I spread around the blame, it will be easier for me) – began in 1942, on a site in the mountains of New Mexico known as Los Alamos. Three years before, Einstein had written to FDR, warning him that recent developments in physics – primarily the splitting of a uranium atom – could be applied to the creation of bombs of unprecedented force. Einstein believed that the Germans were already working on such a bomb – and the fear of them unilaterally creating it was what prompted FDR to launch The Manhattan Project. It was said that the country’s top physicists disappeared overnight as they were called from their work in academia and brought to Los Alamos. Einstein himself did not work on the bomb (he was perceived as a security threat because he was German), though his letter was the catalyst. But many of his colleagues – including Leo Szilard (co-author of the letter Einstein sent to FDR), Enrico Fermi, and J. Robert Oppenheimer (who was in charge of The Manhattan Project) did. The project remained so secretive, that many of the physicists working on it didn’t understand what the final objective was. A select few knew that they were creating an atomic bomb, but there’s speculation that many of them thought the weapon would function solely as a deterrent. Physicists are not usually asked to contemplate wartime killing; best to have death exist only as a theoretical. And so America assembled the world’s greatest scientists to work on a weapon many of them believed would never be used. On August 6th, 1945, the first atom bomb ever used in warfare was dropped on the Japanese city of Hiroshima. 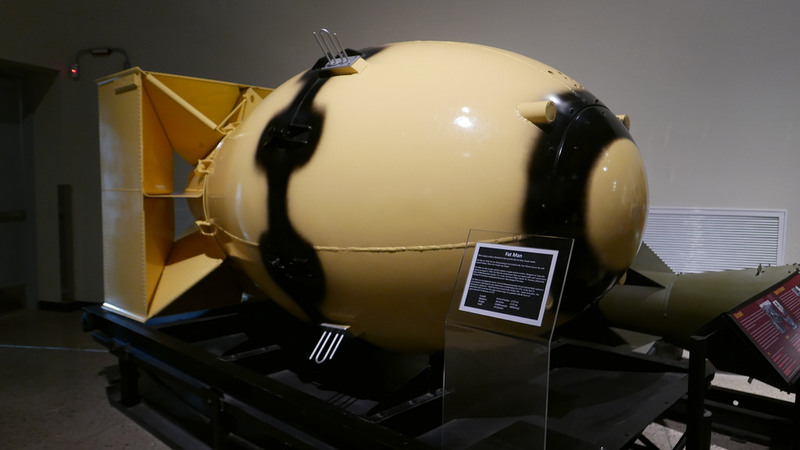 Three days later, the second bomb was dropped on Nagasaki. 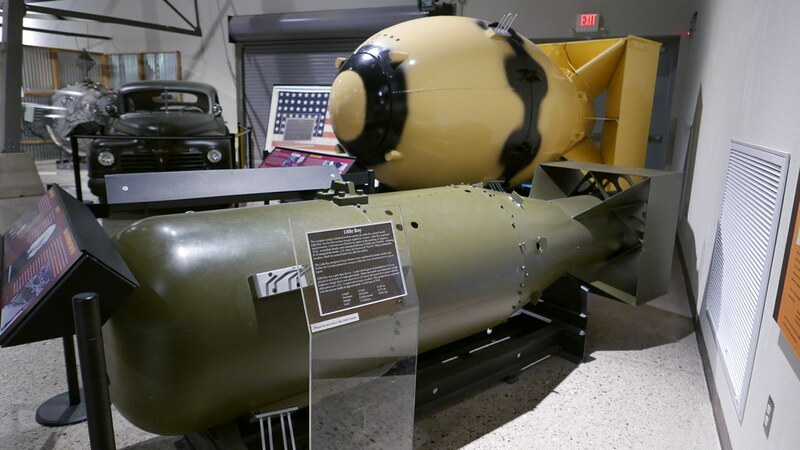 Replicas of Fat Man and Little Boy – the bombs dropped on Nagasaki and Hiroshima – at the National Museum of Nuclear Science and History in Albuquerque. By the time Hiroshima and Nagasaki were bombed, Germany had already surrendered. Hitler’s scientists hadn’t succeeded in creating their own nuclear weapon as Einstein had predicted (Einstein later said that had he known that Germany would fail in their endeavor, he’d never have written to FDR). The bombs were no longer deterrents because there was no one to deter. Rather than exist as some sort of theoretical safeguard against Germany’s use of the bomb, they had now became an active part of the U.S. arsenal. In a sort of distorted moral reasoning, the target committee hoped doing so would mean that the bombs would not be used in future wars. So, they decided this bomb would not just kill — it would do something biblical: One bomb, from one plane, would wipe a city off the map. It would be horrible. But they wanted it to be horrible, to end the war and to try to stop the future use of nuclear bombs. Though each was hit with a fission bomb (in which an atom is split, unleashing a force wave that does initial devastation, followed by radiation), the weapons themselves were slightly different owing to the materials used and the method of detonation. I’ve always found these details profoundly disturbing, because it seemed like the U.S. was dropping different bombs in part just to see what would happen. Would plants be able to grow on irradiated land? Would generations be affected by the fallout? Would water be drinkable? There were myriad questions about the aftermath of dropping a nuclear weapon, and the U.S. turned Japanese civilians into unwilling experiment subjects (and victims) in order to find out an answer. Hundreds of thousands of people died, and their lives hinged on a panel of men who were fighting over which cities to bomb. Kyoto was spared because the U.S. Secretary of War had honeymooned there. The story I’ve been told, time and time again, was that the U.S. had to drop the bombs, because they helped expedite Japan’s surrender, ostensibly saving more lives than were lost. I’ve heard this during history classes throughout high school and college, I saw it reiterated on the placards in the museums at Los Alamos and Hiroshima. The prevailing narrative is this: the bombs brought about the end of the war. Most of us accept this rationale – for most of us, it’s the only story we’ve ever been told. The more research I did on the topic, the more this narrative became problematic. In giving the bombs credit for ending the war, we do not need to analyze the morality of their use. We do not need to second-guess America’s actions. And we’ve created precedent for subsequent U.S. military decisions to deserve less scrutiny. Civilian casualties are now a common result of U.S. military policy, all under the guise of being “necessary” – a train of logic that can be traced back to dropping the bombs on Hiroshima and Nagasaki. More than just creating this alarming legacy, there’s another problem with saying that the bombings of Nagasaki and Hiroshima brought about the end of the war: it may be patently untrue. In the immediate aftermath of the bombings, the global community did not entertain any such belief that the destruction of Hiroshima persuaded Japan to surrender. Some historians argue that Nagasaki, in particular, played no strategic part in Japan’s surrender – the country’s Security Council had already completed discussion of surrender before they heard of the second atomic attack. So why did Japan surrender? The growing reason – one that is touted by Japanese and American historians alike – is that the Soviet Union’s entry into the war was the deciding factor in Japan surrendering. Stalin’s proximity to Japan meant that they could invade the country in a matter of days with troops, and incur far fewer casualties than a U.S. invasion, which would takes months and be far less effective. Russia entering the war meant that it was unwinnable for Japan – and some argue that it was that realization, and not the bombings – that led to Japan’s surrender. Why do both countries embrace the myth? Saying that the deaths of hundreds of thousands of people played no role in ending the war is a tough story to swallow – it makes neither the U.S. nor Japan look terribly good. And there was plenty of incentive for both countries to embrace the narrative that the bombs ended the war. The U.S. now had some sort of moral justification (specious though it may be) for using a weapon of unprecedented force on two largely civilian cities. For Japan, it allowed a similar reprieve from consequence. If Japan’s reason for surrender was the Soviet Union’s entry, then the leaders of the country become fallible – a significant problem, because it meant that the Emperor (who was considered divine) was an imperfect agent. But if a nuclear weapon were the reason for their surrender, then culpability is removed from Japan’s leaders. They couldn’t have known or expected the U.S. to have a weapon of such unprecedented force. So both countries had incentive to buy into the story that the bombs ended the war. Now, decades removed from the events, it’s impossible to say what the truth is. The bombings may have ignited the Cold War and given the U.S. a blueprint for ignoring civilian casualties in the future. One thing can be said, definitively: hundreds of thousands of civilians died. And that, absent of all speculation, is enough to grapple with.